I am not a fruit eater. I’ve always tended to go for sweets involving chocolate, caramel, nuts, etc., but fruity baked goods are often my last choice. 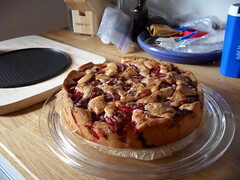 This summer, however, the fruit has been looking lovely, so I’ve been trying to involve it in my dessert-making. This cake is a really nice, really simple thing to throw together – not fussy or delicate at all. You could probably use peaches instead of plums, if you like. I’ve altered it somewhat from the original. Preheat oven to 350°F (175°C). Line bottom of an 8-9 inch springform pan with baking parchment and grease sides. Sift together dry ingredients and set aside. Cream together butter and sugar in mixer until light and fluffy. Add eggs and vanilla and mix until just combined. Mix in dry ingredients in 4-6 additions, scraping sides with a rubber spatula as needed. Spread batter into springform pan – batter will be thick. Arrange plum slices, pressing lightly into batter surface. Mix together remaining pumpkin pie spice and sugar and sprinkle over plums. Bake for 50-55 minutes. After baking, remove cake from oven and allow cake to rest for 15 minutes on a cooling rack. Take off springform ring and allow cake to cool for another 15 minutes. *Don’t have any pumpkin pie spice? You can make it pretty easily: 2 T cinnamon, 2 T ginger, 1 T nutmeg and 1 t allspice. Put it all in an airtight container, shake it up and use it liberally. Mmm..that looks like a nice one!